The Sherwin-Williams Company engages in the development, manufacture, distribution, and sale of paints, coatings, and related products. It operates in three segments: Paint Stores Group, Consumer Group, and Global Finishes Group. The company, which has raised dividends for 31 consecutive years, is a member of the S&P Dividend Aristocrats index. Back in February 2009 Sherwin-Williams announced a 1.40% dividend increase. Over the past decade this dividend growth stock has delivered an average total return of 5.70% annually. Sherwin-Williams’ stock price is currently trading almost 20% lower from its all-time highs set in 2007. The company has managed to deliver a 9.30% average annual increase in its EPS between 1999 and 2008. Sherwin-Williams is expected to earn $3.60 share in FY 2009, followed by $4.10/share in FY 2010. Despite the housing crisis, and expectations of 10% declines in sales for Sherwin-Williams, homeowners would still need to use paint in order to freshen the look of their houses. Home renovation and remodeling projects could be a driver for growth even in a slow economy. Residences are typically the largest investment for homeowners, who tend to spend regularly on maintenance and improvement projects in order to increase their values. I believe that the company has a strong cash flow generation ability, which should serve it well in the longer term. Strategic acquisitions could add to growth, as could new store openings abroad. 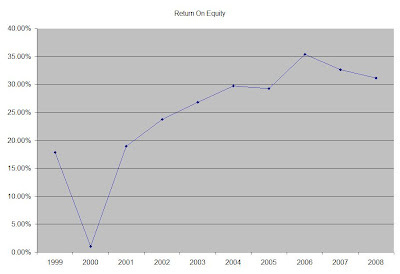 The Return on Equity has generally trended upwards, and has stayed above 20% over the past 7 years. Rather than focus on absolute values for this indicator, I generally want to see at least a stable return on equity over time. Annual dividends have increased by an average of 12.60% annually since 1999, which is higher than the growth in EPS. The company has also managed to decrease the number of dillluted shares outstanding from 168 million in 1999 to 117 million in 2008 through share repurchases. In 2008, the Sherwin-Williams purchased 7.25 million shares of its common stock in the open market, and continued its policy of paying out approximately 30% of the previous year’s diluted net income per share in the form of a cash dividend. A 12 % growth in dividends translates into the dividend payment doubling every six years. If we look at historical data, going as far back as 1989, Sherwin-Williams has actually managed to double its dividend payment every seven years on average. The dividend payout ratio has largely remained under 40% over the past decade, with the exception of 2000. A lower payout is always a plus, since it leaves room for consistent dividend growth minimizing the impact of short-term fluctuations in earnings. Currently Sherwin-Williams is trading at 16.70 times earnings, yields 2.40% and has an adequately covered dividend payment. I would be looking forward to adding to my position in Sherwin-Williams (SHW) on dips below $48.